Motorcycle Event, Motorcycle Rally, Outlaw Biker, Press Release, Tattoosday Comments Off on Gill Montie In Sturgis! STURGIS, SD—JULY 23, 2010–GILL MONTIE AND THE CREW FROM THE WORLD FAMOUS TATTOOMANIA IN BEAUMONT, TEXAS WILL BE TAKING CENTER STAGE AT BOTH BROKEN SPOKE LOCATIONS. WITH GILL “THE DRILL” HOLDING THE REINS, THE TATTOOMANIA MAYHEM IS SURE TO GET EVERYONE’S ATTENTION THIS YEAR AT STURGIS FOR THOSE THAT EXPECT MORE FROM A TATTOO SHOP THAN JUST LINES ON SKIN. TATTOOMANIA IS COMPOSED OF ONLY THE BEST ARTISTS WHO HAVE ALL TRAINED UNDER THEIR MENTOR, GILL MONTIE, WHO IS A LIVING LEGEND IN THE TATTOO INDUSTRY. ORIGINALLY SETTING UP SHOP IN HOLLYWOOD, CALIFORNIA, GILL BECAME AN INSTANT CELEBRITY HIMSELF AND WAS NOT ONLY TATTOOING THE WHO’S WHO STARS IN HOLLYWOOD, BUT APPEARED IN MANY OF THEIR MOVIES, MUSIC VIDEOS, AND EVEN TOURED WITH SOME BANDS DOING SECURITY. GILL IS CURRENTLY INVOLVED WITH THE CONSTRUCTION OF THE ONE AND ONLY TATTOO HALL OF FAME WHERE NOT ONLY WILL HE BE THE ONE OF THE FIRST INDUCTEE, BUT HAS BEEN ASKED TO SET UP SHOP AND WORK OUT OF THE HALL OF FAME LOCATION. KNOWN FOR HIS SKULL TATTOOS, GILL HAS CREATED A TOP NOTCH TEAM OF ONLY THE BEST ARTISTS IN THE COUNTRY AND YOU WILL GET A ONCE IN A LIFETIME CHANCE TO BE INKED BY TATTOO ROYALTY. THIS YEAR PROMISES TO BRING NOT ONLY THE BEST ARTWORK IN THE AREA, BUT SPECIAL GUEST APPEARANCES FROM OTHER WELL-KNOWN TATTOO ARTISTS AND CELEBRITIES THAT WILL BE STOPPING BY TO PAY HOMAGE TO THEIR FRIEND AND FAVORITE INK SLINGER. THE BROKEN SPOKE SALOON DOWNTOWN WILL HAVE TWO FANTASTIC ARTISTS INCLUDING GILL’S SON, SHANE MONTIE AND MATT WASDYKE WHO IS FLYING IN FROM ALASKA TO JOIN THE CREW AND WILL BE OPEN STARTING AUGUST 3RD FROM NOON TIL 2AM WHEN THE BAR CLOSES. OUT AT BROKEN SPOKE CAMPGROUND/STURGIS COUNTY LINE YOU CAN MEET GILL HIMSELF AND FIVE OTHER AMAZING ARTISTS WHO HAVE ALL TAKEN NOTES FROM THE MAN. THE ALL-STAR LINE-UP INCLUDES: THE AMAZING MATT BROWN, JOHNNY JOHNO, FRANK BALL, WAYLON HART, AND GILL’S DAUGHTER SHEILA ROSE MONTIE WHO SPECIALIZES IN COSMETIC TATTOO MAKEUP. THE CAMPGROUND SHOP WILL BE OPEN STARTING AUGUST 3RD FROM NOON UNTIL 2AM AT CLOSING TIME. TATTOO COMPETITIONS ARE HELD DAILY AT BOTH LOCATIONS AND ON WEDNESDAY NIGHT BOTH SHOPS COME TOGETHER FOR THE BEST OVERALL TATTOOS FOR BOTH MALE AND FEMALE WITH CASH PRIZES AND TROPHIES INCLUDED. “IT’S BEEN TAKEN FOR GRANTED THE QUALITY AND CARE OF TATTOOS AND IT’S ABOUT TIME WE HAD SOMETHING LIKE THIS TO BREATHE NEW LIFE INTO THAT PART OF THE STURGIS EXPERIENCE. PEOPLE GET TATTOOS IN STURIGS TO REMEMBER THIS AMAZING RIDE AND ITS NICE TO KNOW YOU CAN GET IT DONE THE RIGHT WAY BY TATTOOS ARTISTS THAT ARE THIS TALENTED AND CARE ENOUGH TO CREATE CUSTOM PIECES THAT FIT YOUR VISIONS,” SAYS GILL MONTIE. YOU CAN FIND UP-TO-DATE NEWS ABOUT WHATS HAPPENING AT TATTOOMANIA AT THE BROKEN SPOKE SALOON WEBSITE COMPLETE WITH THE ARTISTS PROFILES AND PORTFOLIOS SO YOU CAN CHOOSE YOUR FAVORITE ARTIST AND SET UP YOUR APPOINTMENT. THIS YEAR PROMISES TO BE AN UNFORGETTABLE EXPERIENCE AND GILL WOULD LIKE TO INVITE EVERYONE TO CELEBRATE THIS YEAR’S 70TH ANNIVERSARY TATTOOMANIA STYLE. “WITH OVER 40 YEARS OF LIFE EXPERIENCE, STURGIS IS A PART OF MY LIFE AND MY FAMILY’S LIFE. COME AND LET US TATTOO YOUR SOUL,” SAYS MONTIE. Tattoo Mania exploded on the scene in West Hollywood in 1990. The brainchild of world famous tattoo artist, Gill “The Drill” Montie, quickly became a household name in the tattoo industry becoming synonymous with cutting edge quality and tattoo culture decadence. Tattoo Mania set the standard for modern day tattooing introducing legendary artists like Paul Booth, Mark Mahoney, and Bob Tyrell to the tattoo industry. Tattoo Mania list of clients reads like a who’s who in Hollywood featuring stars like Roseanne Barr, Ringo Starr, Poison, Motley Crew, Billy Bob Thornton, Shaquille O’Neil, and Tupac earning a reputation for expert tattooing with a hell of a story to tell at no extra charge. Today Tattoo Mania continues to blaze a trail for others to follow and remains one of the most famous and respected names in the industry. Bigger, badder, and better than ever, Tattoo Mania is bringing the party to Sturgis by teaming up with the Broken Spoke Saloon and is taking tattooing in Sturgis to a whole new level. 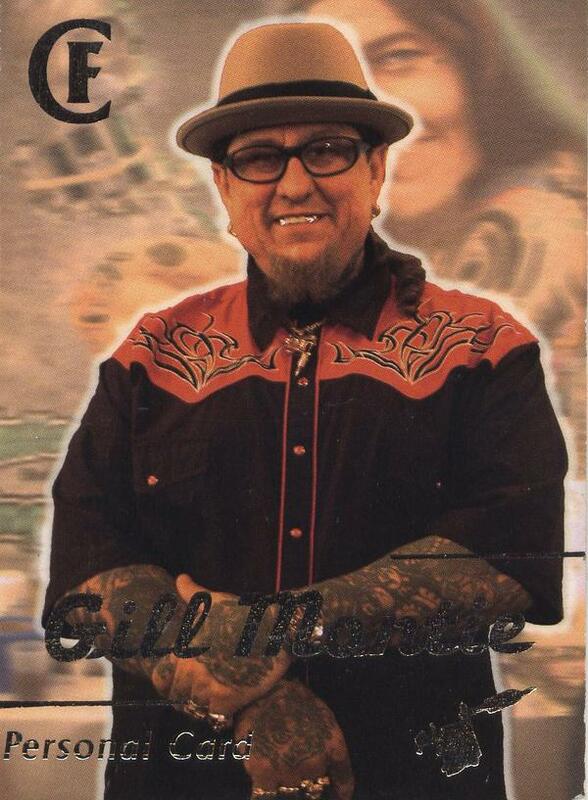 Born in Traverse City, MI on December 18, 1954, Gill “The Drill” Montie has traveled all over the United States since the beginning of his tattooing career in 1974. Tattoo Mania originated in Hollywood, California in 1990 and relocated to Beaumont, Texas in 2001. Tattoo Mania is a shop that takes pride in its work and is a great place to get a quality tattoo or become a tattooer. Motorcycle Event, Motorcycle Tour and Travel, Press Release Comments Off on Daytona Madness!! So, as if I didn’t feel bad enough about missing Daytona… our friend Lisa Ballard sent this release to us to put out… Looks like someone who had just picked up a new Panhead, lost his baby to a burn out pit fire. One thing is for sure… you get the kids from the Limpnickie Lot teamed up with the gang from the Broken Spoke Saloon, and things are gonna get crazy!! Couldn’t put on a better party if ya tried! Rally goers flocked to the Broken Spoke in droves during Daytona Bike Week 2010 and we want to send out a big thanks from the entire staff. Daytona Beach, March 10, 2010- The Broken Spoke Saloon would like to thank all of their patronages that chose the Spoke as their home throughout the Daytona Bike Week. In spite of less than favorable weather, the Spoke’s die hard fan base turned out and put down a positive vibe that made this rally one of the best in our history. The energy was positive and everyone enjoyed the ongoing party. Even the bands fought through some bitter cold conditions to lay down performances that were nothing less than epic, taking the crowd on a sweet journey to the night‘s end. Even Gallagher stripped down to his boxers, determined not to let Old Man winter take him down. 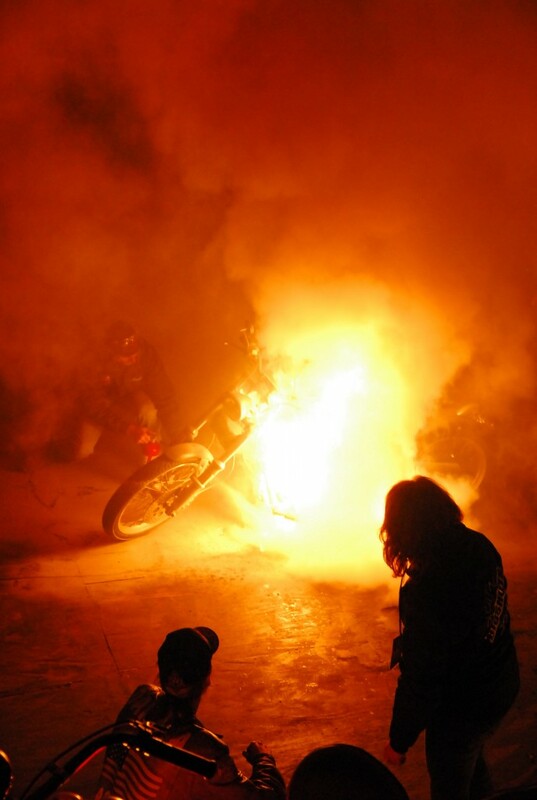 The crowd got more than they expected during the annual Limpnickie Lot night when members of the lot took the stage for a multi-bike, head to head, burnout and all of a sudden one bike, a Panhead, burst into flames right before the crowd’s huge eyes. 30 foot flames added instant heat to the event but lucky, no one was hurt through the ordeal, due to the quick actions of the BSS staff and voluntary firefighters that were on hand. Now we know why Jay Allen has so many fire extinguishers on hand. Burnouts are king at The Spoke and with the kind of unlimited amount of chaos only burnouts can bring to a party, Broken Spoke kept the crowd warm all week with a steady stream of smoke from events like the Baker Burnout and S&S Burnout Competitions. There’s nothing better than pulling into the spoke and seeing a giant cloud of smoke heading through the bar. So how was Daytona, you might ask? Well let’s see…… Smokey burnouts, check. Hell Raising, Check! Killer tunes, CHECK! A week away from the average life…… HELL YEAH!!!! Keep the shiny side up and the rubber side down! Fine Art Fridays: More Biker Art – if you can believe it! Fine Art Fridays, Motorcycle Event, Motorcycle Rally Comments Off on Fine Art Fridays: More Biker Art – if you can believe it! Wow, everytime I turn around there is another press release about another show coming down the pike that has to do with bikes and bikers… I suppose it makes a lot of sense seeing how we are just weeks away from Sturgis and most of the events are taking place in tandem with this annual event. So, without further ado, here are two more fantastic opportunities to feed your creative soul with visual stimulus while you sip a cold one in the black hills. Jay Allen is proud to announce the addition of a fine art gallery in the upper portion of the main bar of the Broken Spoke Saloon. For Sturgis 2009, the work of David Uhl, John Guillemette, Jeff Cochran and Colleen Swartz will be on display along with bikes from Billy Lane, Ron Finch, Samantha Morgan and the BSS Worlds Fastest Indian. David Uhl, has been called “The Norman Rockwell of Harley-Davidson artists.” And his work is much sought after by many collectors. A rider, oil painting artist and an accomplished commercial illustrator, David will bring originals from his collection which focuses on imagery from the turn of the century. You can view more of David’s work at his web site, www.uhlstudios.com. John Guillemette is an oil on canvas artist from Revere, Massachusetts. His original oil paintings are vibrantly colored and meticulous in their detail and many of them feature classic as well as custom motorcycle themes. John’s artwork has been featured in many national publications such as Hot Bike, Thunderoads, The Motorcycle post, Easyriders and V-twin magazines. In addition, John’s original works of Arlen Ness and Jessie James from his “Masters and Machines” portrait series are on display in the Motorcycle Museum Hall of Fame in Pickerington, Ohio. You can view and purchase John’s original oil paintings and limited edition prints at The Broken Spoke Gallery as well as his website at www.bikesoncanvas.com. Jeff Cochran is the founder of SuckerPunch Sallys, one of the most successful Old-School production bike manufacturers in the US. In addition to building and riding custom bikes, Jeff spent a decade studying alternative lighting techniques in photography. When Jeff started SPS he did all of his own photography and advertising. This led to many publications requesting art. Jeff has become a noted photographic artist in his own right and now shoots for several magazines throughout the United States and Europe. You can view more of his work at www.speedkingphoto.com. Colleen Swartz’s work can be found in many national and international publications. Starting back in 2003, Colleen traveled the rally circuit offering souvenir photo shoots and building relationships. Now, more than 6 years later, Colleen has turned these relationships into the passion of her life, shooting bikes for publication and individual use, working with beautiful women and using her photojournalistic talents to document the history that unfolds every day. Her work can be viewed at www.digitalmagicbigshots.com. The Legends Gallery opening will be on Sunday, August 2nd at 6-9 PM following the conclusion of the Michael Lichter Ride with Sugarbear at the Sturgis County Line. You are welcome to join the curator, Jay Allen along with the legendary artists, bike builders and iconic industry guests for a hors d’œuvres reception. The Gallery will be open throughout the Sturgis Rally from Noon until Midnight. Sturgis Monkey Rock (formerly Thunder Road) has partnered with Segal Fine Art to bring the David Mann Museum Exhibit to the 69th annual event. The exhibit will feature over 50 David Mann originals, many not previously offered for public viewing, including the world famous “Ghost Rider” featured here (and on ArtBiker’s Chest). The collection of never before seen paintings comes from the archives of Paisano Publications (Easyriders Magazine) and demonstrates Mann’s broad range of creative excellence. The genius of Dave Mann will be exhibited at Monkey Rock daily July 31 through August 8 from 9:00 am to 7:00 pm. Other pieces unique to Segal Fine Art will also be available. Monkey Rock Event Center is located at the heart of the rally on Highway 34. There is an abundance of free parking. Entertainment and event updates as well as exhibitor information can be found on their website. Monkey Rock. Hope to see some of you at these two events in the next few weeks.